The first mention of cats with "white color, black ears, paws and tail" dates back to the 14-16th centuries, in manuscripts from Ayutthaya, the capital of ancient Siam (Thailand). No one can say from where such cats appeared in ancient Siam or who their ancestors were. 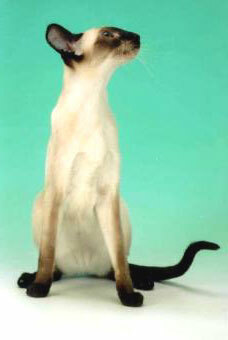 Inhabitants of Siam asserted that the first Siamese cat was born from the intimacy of a monkey and a tiger. The early history of Siamese breeds has become known to us only from legends. European travelers who visited Siam up to the end of 19th century told that inhabitants of that country worshiped these cats as the keepers of sacred temples and treasures, and the defenders of dead people’s souls. Siamese cats lived at the temples, were looked after by monks and participated in religious ceremonies. The travelers also said that besides monasteries and temples, only the royal family of Siam could own those cats. 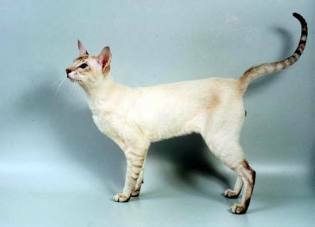 Siamese appeared in Europe in around 1870-1871, and almost a century later - at the beginning of the 1960s - in Russia. The first pair of Siamese cats of traditional-type was brought to Moscow by Obraztsov S.V., our famous puppet-show founder. The cats had, according to modern concepts, a round apple-shaped head and rather compact body (today, cats of that type are allocated into a separate breed - "Thai"). But almost a century of selective breeding made a huge influence on their appearance. A Siamese cat today is an extremely elegant, harmonious and graceful creature, shaped like a fashion model. These cats posess superlative characteristics: emotional temperament (highly active, agile and playful, attention-seeking, can be very vocal - the voice cannot be mistaken for any other breed but has been mistaken for a newborn human child), high intelligence, strong determination, devotion to its owner. They like to be in the center of attention and to be the cause of admiration. 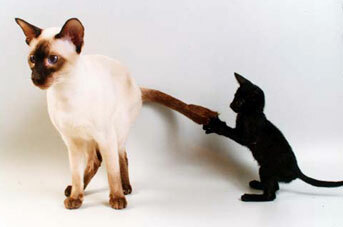 Siamese are very attentive and enterprising, they love active games and possess special talents for training. Their friendship and attachment to the owner are very high; at the same time they are watchful and circumspect towards other people. All Siamese are social and territorial. In all these characteristics, Siamese cats share similarities with dogs. The owner is the whole world for this cat. The cat adores its owner with sincere trust and follows his/her every step. As a Siamese can hardly bare loneliness, it is quite good if there are other pets or children in its new family. Oriental cats ("orient" - the east) are identical to Siamese cats on body type, character and temperament and make a united breed group of east shorthaired cats (siamo-oriental group). They have identical standards and differ in colors of coat and eyes. 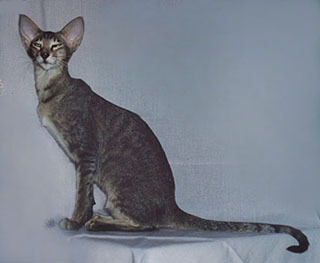 Oriental cats have green eyes and the coat is completely colored (solid or patterned), while Siamese cats have characteristic "Siamese" color (with solid or striped marks of points) and dark blue eyes. In the majority of Russian and European cat clubs it is permitted to mate Siamese and Oriental cats; that is why we can see both Siamese and Oriental kittens in one litter.